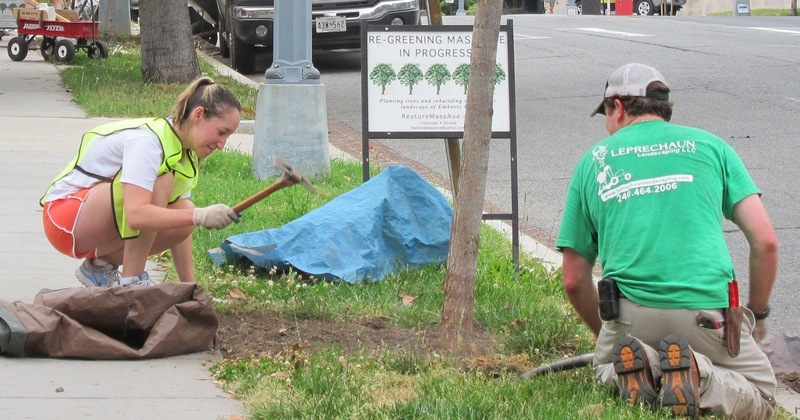 WASHINGTON’S HOT SUMMERS hit sidewalk trees with a double whammy. Heat from the sun above bakes the leaves and dries the soil. The sun’s heat also bounces up from the pavement baking the leaves from below. So trees are cooked from above, cooked from below, while their growing medium dries out. Ouch! So regular watering of young and vulnerable trees is crucial, especially trees in paved areas. Each summer, Restore Mass Ave urges property owners to turn their hoses onto the sidewalk trees: 25 gallons each week, dripped slowly. Or to refill the bags we zip around the trees, which allow a slow drip from holes in the bottom. In the terrible drought of 2007, we paid for a truck to water about 120 city trees. (Thanks to your donations!) We can’t be sure but believe that many of these trees would have died without this help. Our Treekeeper volunteers work on hard-to-reach “orphan” trees, by dragging hoses hooked to nearby spigots. Sometimes they carry water-filled buckets in our red Flyer wagon to and from a parched tree. This summer, fire hydrants will be our new rescue tool. 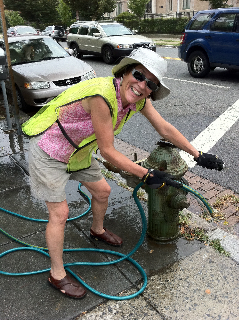 We’re being loaned a Fire Hydrant Meter by the Dupont Circle Citizens’ Association on days DCCA doesn’t need it. 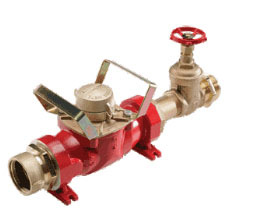 The device (see photo) is a water meter and pressure converter; there is also a key for unlocking the hydrant. 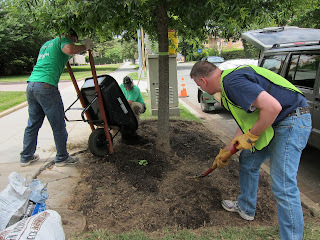 Thus our water-brigade can water the sidewalk trees which need water, with the amount they need, when they need it. Note: RMA will provide this care on just few afternoons; the hydrant-watering is NO substitute for the main weekly water trees building owners should provide to nearby sidewalk trees. See below for useful links for fire hydrant watering. We thank Doug Rogers, chair of the DCCA Tree Committee, and Greg Zahn of DCCA for sharing the equipment and how to use it. Thanks also go to Washington Area Bicyclist Association (WABA) for the training class in using hydrants for tree-watering. Casey Trees inspired us all with their Water By-Cycle Cart it uses to be sure the trees it plants on city streets get enough water. 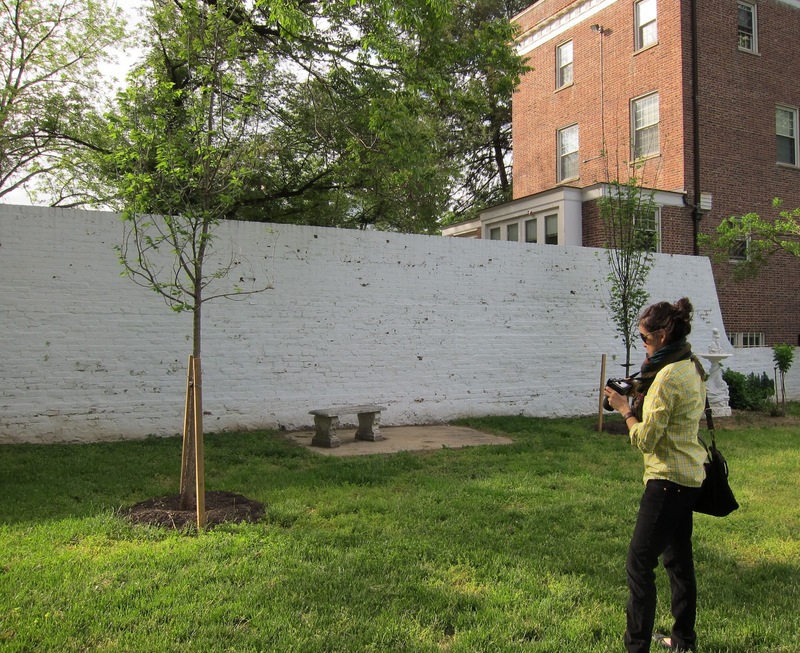 IN MAY THE Embassy of Venezuela planted 18 new trees as replacements for a very large old tree it sought to cut down, to comply with the DC tree law. This planting will extend the tree canopy over bare parts of the Ambassador’s residence at 2443 Mass Ave on the corner of Mass Ave and California Street. 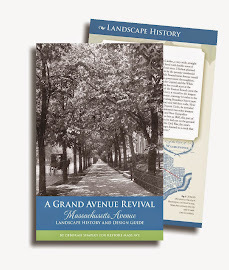 Fifteen trees were added to this campus, notably four new ‘Valley Forge’ elms that re-build the ‘second row’ by the Mass Ave sidewalk, and a tulip poplar at the corner. Behind the military office at 2437 California Street, three cherry trees were planted. Under the tree law, 18 new trees were required for the city to allow the Embassy to cut down an ash tree behind the military office that was 115 inches in diameter. The city asked Restore Mass Ave to advise on the new planting. 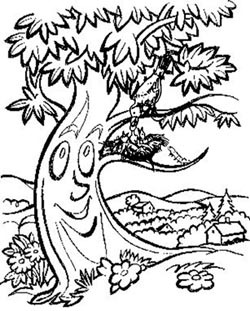 Under the tree law, to cut down a healthy “special tree” of 55 inches or greater, an entity – even a foreign mission – must agree to plant “replacement trees” whose “circumference inches” (CI) equal that of the tree to come down. Or they must pay into the Tree Fund. * How big is a 55” CI tree? 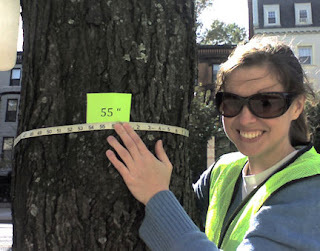 Below a Restore Mass Ave Treekeeper shows you. The Venezuela Ambassador’s residence is one of the loveliest campuses on Embassy Row. When it was built in the 1930s, the old-growth forest of Kalorama was left standing; so were the “second row” trees lining the sidewalk. As these older trees die, the bare land needs new groves. Overall, city land needs 2,000 more acres of mature tree canopy. On Embassy Row, everyone in the community is trying to help! Trees were provided by Landscape Development Co., Woodbine, Md. ONE WAY THAT trees help cities: a neighborhood with lots of mature trees needs less maintenance of underground storm drains and tunnels. 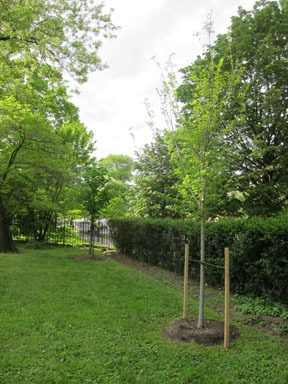 Here are two storm-fighting trees Restore Mass Ave planted with our partner Casey Trees in March. In the foreground is a Northern catalpa (C. speciosa). Behind is a swamp white oak (Q. bicolor). Don’t they look fragile? 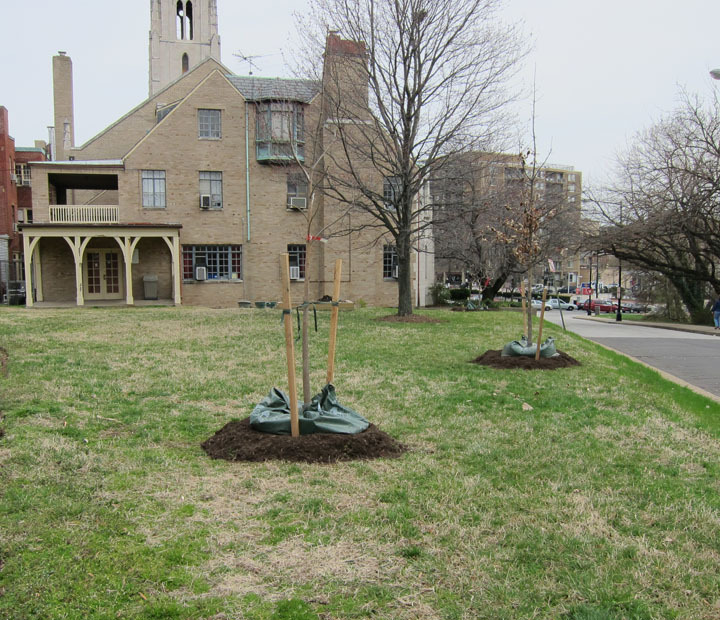 But thanks to care by the Church of the Pilgrims, which abuts this land, these trees will grow into big, spreading structures that lessen water runoff onto 23d Street (on the right) and down to Rock Creek. That is why we planted next to Rock Creek valley. We’re especially glad that the Park Service gave permission for these trees, because after the planting, we learned that there will be a one- to two-year project to replace the underground pipes taking storm water down to the creek here. 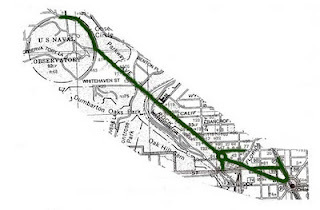 The city’s old combined sewer and storm system (CSS) backs up in storms. In sudden drenching storms sewage etc., instead of flowing through the system to the Blue Plains plant, overflows into the Anacostia and Potomac rivers and Rock Creek. One outflow pipe is by this location. * As part of a pipe and tunnel upgrade that’s six year’s on, these deep old pipes will be replaced. 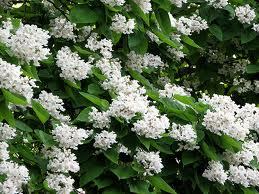 Below are the flowers of a mature catalpa tree, white and trumpet-shaped in showy arrays. Catalpas grow 40 to 50 feet tall and spread 20 to 40 feet wide. With large trees, about a third of all rainfall is caught by the leaves. The trunk takes up more, while the root system carries much of the rest down in the ground. This is Nature’s plumbing, working for us. *The CSO 36 upgrade is part of DC Water’s Clean Rivers Project. Go to DCWater.com for updates. Thanks to the Casey Trees staff for this imaginative choice and arranging to plant on this site. Thanks to Church of the Pilgrims, especially Ashley Goff, for maintaining these and other new trees near the church.